edit: that looked weird without quote. Location: Somewhere close to the middle of the world. Taberah wrote: Sooo what you guys planning? I was thinking of making a coastal or plain city. Maybe throw in a couple humanoid creatures with some Chivalry. Its still a toss up on the creatures. Might go with one of the more standard races(human/dwarf), but been thinking some more bestial race could be fun. Course nothing concrete since circumstances will most likely change before I get to do any of that. If other players will 'respect' other god's areas, then things may not be too chaotic. I have about 8 or more turns planned for the South East island/continent/landmass that I put mountains on. (This is why I wanted a faster/lower shape land cost.) By the time we get to Age 2, I have a race and a couple of subraces in mind, and several city sites in mind, and at least 2 advances in mind. So, I'm happy to mind my own business in my corner of the world for a long time. If other players want, I can probably come up with ideas for other parts of the world too, if they run out of their own ideas. Nerre, did you add in the bonus point for being under 5 left last time, or will we do that? its a german page but it will do. site is good, its a computer magazine. already in, everybody got +1. btw, you don't have to create a world in which the races fight each other. the more peacefull it is, the better, since its less work for me. Traits: Marksman 3, Hunter (Can create traps for small creatures, can do basic tracking, can skin animals. Gets a 1+ attack in dealing with any woodland creatures), Basic trainig with Coates, First aid, Deer gland 1/10 turns (partly washed of). Inventory: Short Bow, Short Sword, Hunting dagger, 10 Arrows, Backpack, Hatchet, Flint, 30m Rope, Blanket, 5 Leather, 7 Meat, some Bones, 1 deer musk gland, 2 sinews, 1 set of stag antlers. - Endurance (Passive) = he can defend himself while at 0 HP. Enemies must penetrate his defense to kill him. - Shield Proficiency (Passive) = +1 Def when using a shield. oh and i figured out the map yeah for me ! my plan is to take over all of the tiny islands you guys can keep the main land for yourself. Nice! got just enough points for what I wanted to do. 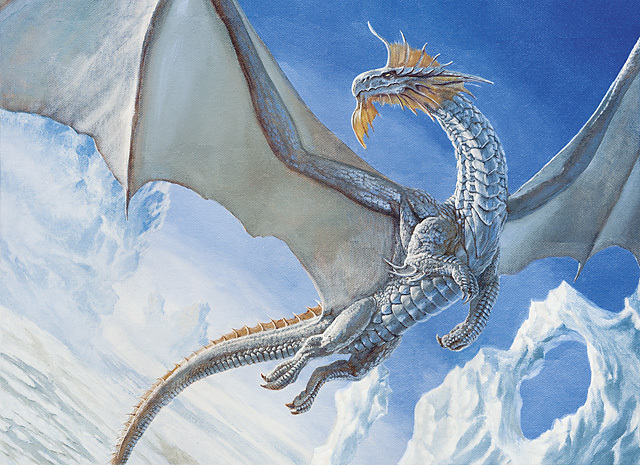 Next he creates a silver dragon who inhabits the nearby mountains. A creature whom devotes itself to helping those in need before all else, fighting evil and stopping corruption. He is granted the name of Honored One. Spending 3 points to create Mountains and 10 Points to create an avatar of good. Last edited by Taberah on Fri Jan 20, 2012 9:57 am, edited 1 time in total. Taberah wrote: Nice! got just enough points for what I wanted to do. sorry, but i have to say no, you don't. creating a race in first age is 22 points, terraforming 3, climate 2. Erm "Create Avatar – Through this power, the god creates a major figure within the history of the world. These may be high priests, dragons, warriors, dynasties, or the like." Ah if it's too similar to a race I can change it to a singular creature that way it can't bread and stuff. Edit: It's now one dragon. I think things like high priests and dynasties work only if there is a base race. i think it means dragonS since more than one player could create one. but if you want a swarm, than it would be undividable and had to be always in the same hex. if thats not a problem it is ok as avatar. if anybody else creates something please tell me if it is a race, an avatar or an order. Hm I see your point. Not a problem at all. I changed it to one creature that way it's a non issue. Your previous language, "creating a race", means something specific in the game that you can't do yet. Taberah wrote: Spending 3 points to create Mountains and 10 Points to create an avatar of good. However, this is perfectly legal, and if you want to call your Avatar "The Silver Dragon", then that sounds like what you intended. Heh, although you and I might have a race to see who creates the race of dragons first. Thats okay though, I can let you have dragons. I have an alternate idea for my race. Yeah I used horrible wording, I just ment to create a few not a mob. Taberah wrote: With that said I don't actually plan to develop a dragon race. I just wanted dragons to be a guiding force in the world. Well, if that is the case, I think I can guarentee they will be a 'guiding' force. + = Muhahaha? Uh oh. hopefully it's nothing too mischievous. Taberah wrote: Uh oh. hopefully it's nothing too mischievous. What? I always laugh like that. Its a throat condition, really. make your moves, you puny mortal...erm...gods. In case I can't post again later, I'd like 3 more swamps in D6D5, E5 and F6 please! Last edited by thinkslogically on Sat Jan 21, 2012 4:05 am, edited 1 time in total. I will be gone over the weekend, so please take your time with your moves. I think there won't be an update till monday morning (german time). so when should we be starting to creat races ? Up to each player. I want to build up the world a bit more personaly. Others might want one soon so they might start saving points. askstoomuch wrote: so when should we be starting to creat races ? Typicaly in Age 2 when they cost the least. In Age 1, now, it would cost the most, and cause you to forfeit bonus points for a round or 2 as you build up to the 22 cost. You'd also give up the opportunity of the cheapest land shaping. OTOH, you'd have the fame of having the oldest race, which might make for a good story. It is still your turn. That will leave me at 2 Power. 1. Why do you people insist on using brushes? It makes it so time consuming to go and fill the spaces I want to interact with. 2. Taberah, you have no clue how much danger you are in for shaping my mountains like that. I'm the god of order, random shaping is not acceptable. But but I used the fill tool :<. The shape is a hexagon.